Local gifts from the Bundaberg North Burnett Region to give your loved ones this Christmas. Gift your loved one's memories to last a lifetime with a ticket to the Mon Repos Turtle Encounter to see the turtles nest and hatch. 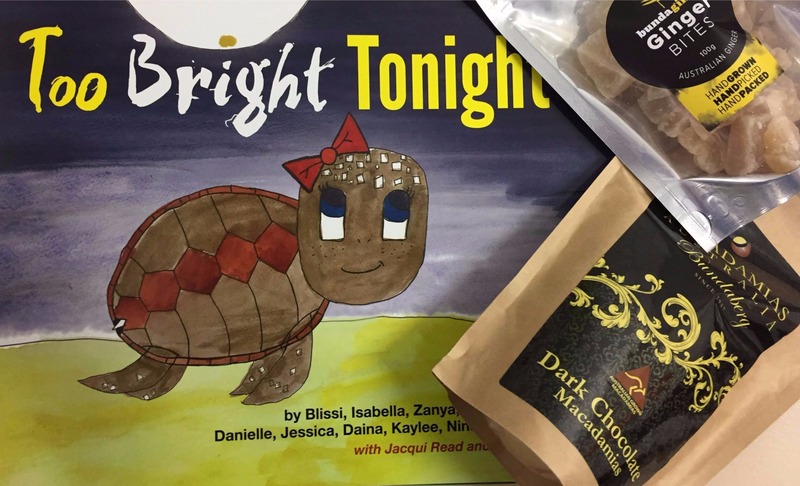 'Too Bright, Tonight' is a locally produced book written by students from local primary schools about the journey of a baby turtle to the sea. This is the perfect gift for the little ones and can be purchased from the Bundaberg Visitor Information Centre and the Mon Repos Turtle Centre. Everyone's favourite gift, chocolate, just got a whole lot more local. Macadamias Australia's dark chocolate macadamias are the most delicious stocking filler and can be purchased from Macadamias Australia directly, the Bundaberg Visitor Information Centre and various other outlets. Buy your favourite person the gift of adventure with a day trip to Lady Musgrave Island or Lady Elliot Island to swim with the turtles, explore the islands, and dive the coral reefs. Catch up with an old friend this Christmas and take them to Alowishus Delicious for a coffee and gelato. Pick a beach, any beach, and grab the whole team for some family time. Take in the view at Elliott Heads, let the kids run wild at Bargara Turtle Park, watch the waves crash at Neilson's with fish and chips, or enjoy a quiet day learning to paddleboard at Woodgate Beach. Step out of the kitchen, take off your apron and take the night off. Head to The Waves Sports Club for a no-hassle, delicious meal with an option to please even the fussiest of eaters. Christmas is a stressful time so give the gift of relaxation. Book a friend into a beachfront resort at Bargara for the night so they can relax and refresh for the hectic year to come. A staple on any Aussie Christmas menu, grab your fresh local prawns from Grunske's by the River and you'll be everyone's favourite this Christmas! Bundaberg is abundant in produce and ginger is one of our key flavours. Bunda Ginga's locally grown and made Ginger Bites are the perfect stocking filler.